These glossy Regular Chips designs by Snyder of Berlin are all different. Flavor color coding is not a prime requisite, which it should be. A balance of fonts and text sizes is not balanced. The imagery is old fashioned or fussy. Even the popular matt bags of forward thinking rivals has been eschewed for ultra glossy bags. As part of one of the United States biggest snack food producers you would think a design company will be employed at vast cost to design something obvious and simple at some stage in the near future. These Chips were very light and crispy. There was only a real crunch when several were eaten together. The Snap Test revealed a slightly thicker regular Chip than some, but overall it was a fairly standard crunch for a fairly standard Chip. These Chips were mostly a lightish white yellow, with some browning and darker yellow areas. Although there was no salt added there was a fair amount of visible oil. Interestingly, there was still 2grams of saturated fat for little over a dozen Chips. As regular readers of Chips & Crisps reviews will be aware, we do not consider ourselves the best judges of plain or flavor-free Chips. 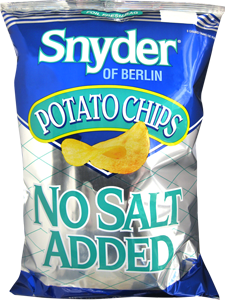 With that in mind, these tasted no different to the Snyder of Berlin Original Flavor. We would like to say the taste altered slightly because of the missing sodium content, but unfortunately our palates are not refined enough. If you are similar, it would be sensible to go for this option instead (especially if your doctor advises you to avoid salt). You may also want an exciting sandwich to go with them.